The leading independent specialist for windscreen replacement and windscreen repair based in Belfast and serving all of the Belfast area. National Windscreens Belfast fitting centre provides windscreen replacement and windscreen repair services to businesses and individuals throughout Belfast and the Belfast area. 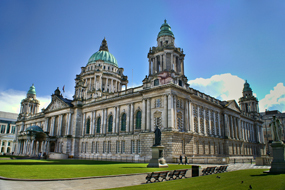 Belfast is the capital city of Northern Ireland and it is also Northern Ireland’s largest city. The city is in the County of Antrim, with some of the southern and eastern parts being situated in County Down. Belfast is well connected to the rest of Northern Ireland by the A2, A6 and A20 which all connect to the M1, M2 and M5 which provide ease of access to Belfast and the surrounding area. Only in Belfast can you trace the Titanic story to its source, with the world’s largest Titanic visitor experience. The Belfast windscreen fitting centre and its mobile vehicle glass technicians service the needs of Belfast and the surrounding area including Ballymena, Larne, Newtonabbey and Bangor. With 108 fitting centres and over 800 mobile technicians, National Windscreens operates the UK's largest windscreen repair and windscreen replacement network. The company provides low cost, high quality windscreen replacement and windscreen repair from its Belfast fitting centre 24 hours a day, 7 days a week, 365 days a year. Repair and replacement of all types of vehicle glass including windscreens, rear windows and side windows is undertaken throughout Belfast and all of the Belfast area.